Vic Wolfe displays honey harvested from his hives. Meigs County Extension Agent Kevin Fletcher speaks to garden club members, encourages proper gardening techniques. Sheila Curtis arranged a Duo-Design, which features a different arrangement on both sides. Peggy Crane designed an Eclectic arrangement and also a Curve, using roses in memory of Pat Holter. Melanie Stetham used dry materials in her Fantasy Flow design. Joy Bentley illustrated both Stretch and Angular designs using a variety of fresh organic materials. Bees navigate using spatial memory with a “rich, map-like organization”. Bees may be solitary or may live in various types of communities. Bees are able to sense the presence of desirable flowers through ultraviolet patterning on flowers, floral odors, and even electromagnetic fields. Honeybees communicate by the “waggle dance”, in which a worker indicates the location of a food source to other workers in the hive. Bees can recognize a desired compass direction in three different ways: by the sun, the preferred or main compass, by the polarization pattern of the blue sky, and by the earth’s magnetic field. 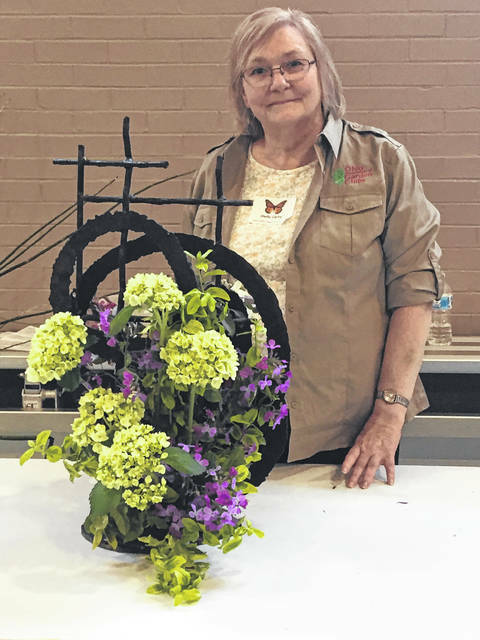 SYRACUSE — Meigs County Garden Clubs (MCGC) recently hosted the Spring Ohio Association of Garden Clubs (OAGC) Region 11 meeting at the Syracuse Community Center. Region 11 includes garden clubs from Athens, Gallia and Meigs. The theme for the meeting, “Think Spring”, was prominently featured in the decorations as guests from Gallia and Athens garden clubs enjoyed breakfast during the meet and greet. During breaks, guests browsed tables filled with sale plants and silent auction items. 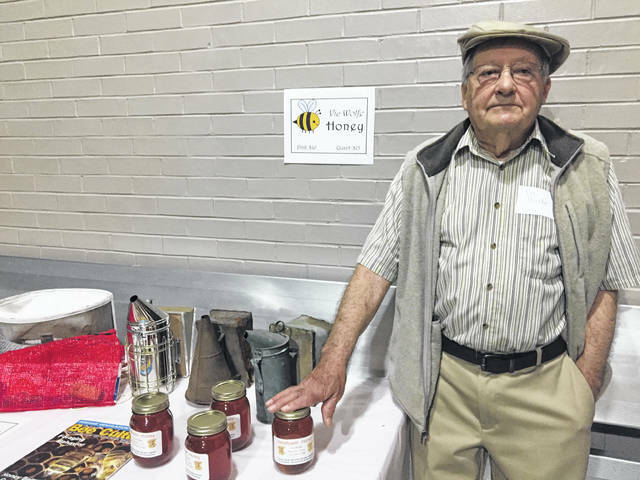 The mornings program began with “The World of Bees and Honey”, presented by Vic Wolfe of Racine, Ohio. Wolfe has been a beekeeper since purchasing his first hive 1997. He said his interest began after noticing a lack of bees in his yard. “I looked out one spring, and I didn’t see as many bees as usual, and I wondered why,” said Wolfe. Wolfe was not alone in his observation; what he was witnessing was a worldwide phenomenon. Local disappearances have occurred throughout history, but this time the vanishing of bees was so widespread scientists began to investigate and named the syndrome Colony Collapse Disorder (CCD). No single proposal for the cause of CCD has been accepted in the scientific community, but there are numerous suggestions, including infections, malnutrition, pathogens, loss of habitat, and pesticides. He shared some interesting facts: a colony of honeybees settled in a hive is a swarm; honeybees emigrate together from a hive accompanied by a queen to start a new colony, this is called swarming. While bees are swarming they do not sting because they have filled themselves with honey in anticipation of the move. He said bees communicate by dancing, and that scout bees are instructing other bees on the location of the discovered nectar source. When asked about purchasing honey in a grocery store, he urged everyone to buy locally. A tip for keeping bees out of bird feeders is to place Crisco around the feeders. “It keeps ants away too. They are both hunting for sugar and some of the seeds are sweet,” noted Wolfe. Wolfe explained that bee keeping is a complicated and expensive business, requiring dedication and knowledge to maintain healthy hives and that the honey we all enjoy is the way bees store food for the hive to eat during cooler winter periods when they are unable to forage. This was a ideal segue for Meigs County Extension Agent Kevin Fletcher with the topic “Beneficial Plants and Insects”. 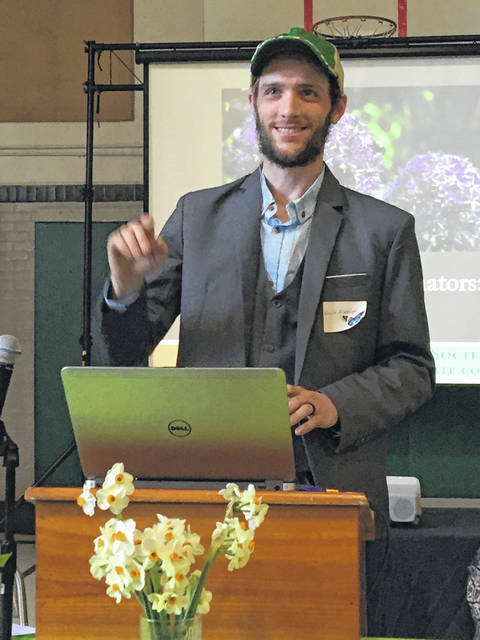 Fletcher introduced a power point presentation developed by The Ohio State University, University of Wisconsin, and the Xerces Society for Invertebrate Conservation that illustrated many different types of gardens that are attractive to pollinators. Fletcher explained pollinators can be selective in their choice of plants, and that each have special needs, so a variety of flowering plants is recommended. The presentation showed how flowers use a variety of strategies to attract pollinators, including “petal color, scent, UV light patterns and nectar guides. Bees in particular use floral qualities such as polarized light patterns, petal texture, temperature, humidity, and electrostatic charge to help them locate flowers”. Fletcher suggested flowers with blue, yellow, purple, violet, and white are best, since most pollinators see light along the orange-yellow spectrum. Complete eradication of insects can be harmful to a garden. “Chemicals do not discriminate in which insects are harmed. Some insects are vital to a healthy ecosystem and by destroying them you upset the balance and make the garden vulnerable to destructive insects,” said Fletcher. Chemicals also harm pollinators. Not only can pesticides result in immediate death, pollinators often carry the product back to their hives or spread it to other plants, exposing even more pollinators to the effects. Joy Bentley, Sheila Curtis, Peggy Crane, and Melanie Stetham presented the afternoon program. 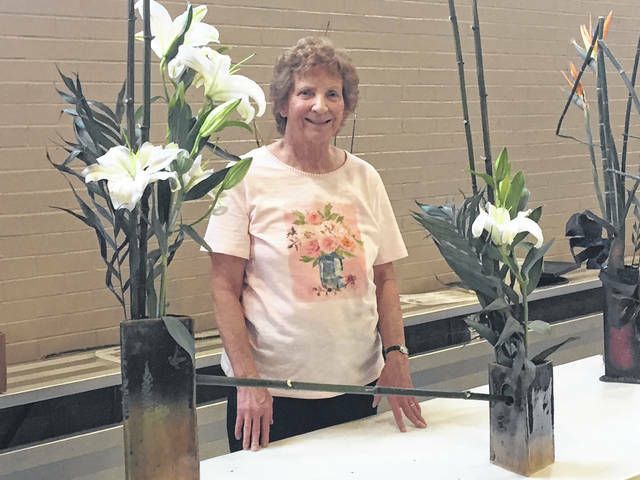 These Meigs Garden Club members constructed flora designs using themes that will be on the program of their next show in August at the Meigs County Fair. The business portion of the day began with Regional Director Susie Jennings welcoming the group and introducing Shirley Hamm to delivered the devotions. Jennings conducted the meeting that included an overview of Ohio Association of Garden Clubs programs and events by OAGC President Jeri Rea. OAGC Vice President Suzy Parker asked for Meigs Garden Clubs support in hosting the 2019 OAGC convention held each year in Columbus. Reports were given by Region 11 Secretary Sara Spurlock and Treasurer Margaret Murray, and by individual garden clubs. The Syracuse Community Center Board of Directors served a homemade lunch, with homemade ice cream for dessert. 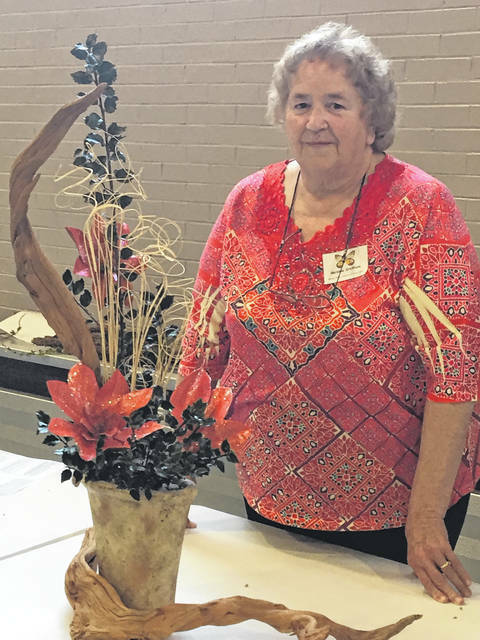 Meigs County garden clubs include Chester, Rutland Friendly, Shade Valley, Wildwood, and Winding Trail. 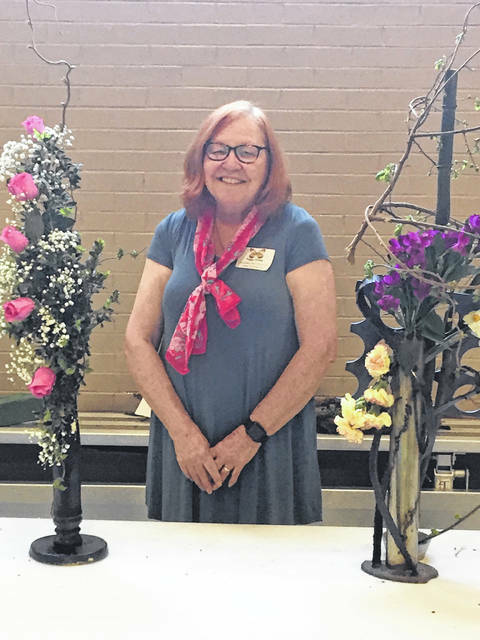 In addition to hosting the event, the group exhibited a memorial display featuring longtime members Betty Milhoan, Wildwood Garden Club, and Pat Holter, Chester Garden Club, both of whom passed away earlier this year. https://www.mydailytribune.com/wp-content/uploads/sites/42/2018/05/web1_5.15-Garden-1_ne20185141617452-1.jpgVic Wolfe displays honey harvested from his hives. https://www.mydailytribune.com/wp-content/uploads/sites/42/2018/05/web1_5.15-Garden-2-Kevin-Fletcher_ne201851416177633-1.jpgMeigs County Extension Agent Kevin Fletcher speaks to garden club members, encourages proper gardening techniques. https://www.mydailytribune.com/wp-content/uploads/sites/42/2018/05/web1_5.15-Garden-3-Shelia-Curtis_ne2018514161713187-1.jpgSheila Curtis arranged a Duo-Design, which features a different arrangement on both sides. https://www.mydailytribune.com/wp-content/uploads/sites/42/2018/05/web1_5.15-Garden-4-Peggy-Crane_ne2018514161716949-1.jpgPeggy Crane designed an Eclectic arrangement and also a Curve, using roses in memory of Pat Holter. https://www.mydailytribune.com/wp-content/uploads/sites/42/2018/05/web1_5.15-Garden-5-Melanie-Stethan_ne2018514161720693-1.jpgMelanie Stetham used dry materials in her Fantasy Flow design. https://www.mydailytribune.com/wp-content/uploads/sites/42/2018/05/web1_5.15-Garden-6-Joy-Bentley_ne2018514161724641-1.jpgJoy Bentley illustrated both Stretch and Angular designs using a variety of fresh organic materials. Lorna Hart is a freelance writer for The Daily Sentinel.